The Maguires of Tempo, whose substantial estate dated from the Ulster Plantation in 1610, were the only gaelic family in Fermanagh to survive the upheavals of the next two centuries with their property more or less intact. 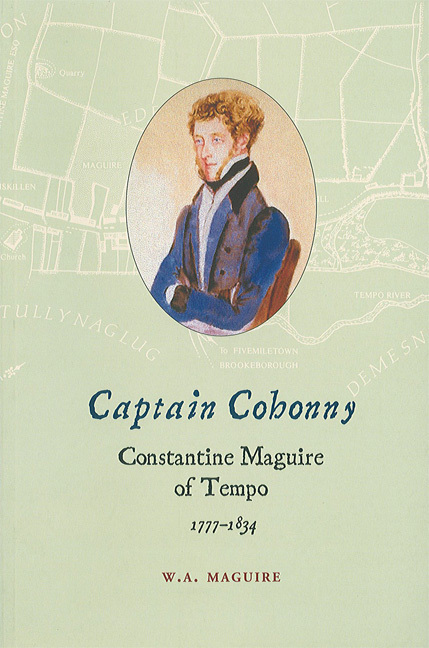 By the time Constantine Maguire ' the subject of this book ' inherited in 1800, however, only a fraction remained. The extraordinary story of this resourceful, not to say ruthless, man's struggle to retain his social standing ' in the course of which he married a famous courtesan and then fell in love with a mistress of his own (who lived with him for the seven years he chose to stay in the debtors' prison in Dublin) ' reads like a novel of the period. His brutal murder in Tipperary in 1834 was a suitably gothic finishing touch to a rackety career. At a more serious level, the tale of Captain Cohonny' throws useful light on some obscure aspects of life and death in early nineteenth century Ireland.